A Sally Beauty Supply opened up near my house and I have been kind of obsessed with trying out new products. I got an email for a buy one get one free deal for L'Oreal Liquid Hair Chalk and decided to pick up some. The bottles were pretty small, so I got two purple. I was going to also get two blue as well but there were out. I had never used any hair chalk before so I was a little disappointed that it really didn't come with much directions. The limited directions on the bank of the tiny bottles they have say to apply it with a tint brush or your hands, comb it out to help make sure hair is fully saturated, then blow dry hair. I wanted to do my whole head and luckily one bottle did exactly half my head, so two was perfect. While I was working pretty quickly, it was already drying quickly and causing serious tangles and crunch to my hair. After blow drying and brushing it out as much as I could my hair was pretty crazy, but the color looked pretty good. My hair has some natural highlights in it and this showed up really well in those places. Besides my now crunchy hair, which I was somewhat expecting thanks to YouTube videos, the worst of it all was my bathroom. 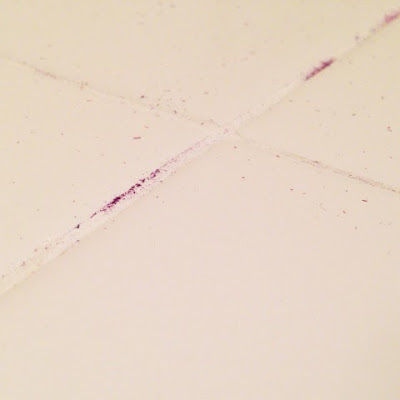 Since the stuff was drying as I was brushing, the brushing and blow drying sent a fine purple dust all over my bathroom, literally coating EVERYTHING. I cleaned the whole space twice but I still need to do it a third time. And let's not talk about the grout. Ugh. I left the stuff in my hair for the day and only a couple people noticed in the right light. While I didn't put much of it on my scalp (or so I thought) it actually made my scalp feel pretty dry and itchy. And that itching = purple nails. Cool. That night I washed it and shampooed it twice until the water ran out pretty clear. But I was surprised to see my hair was still quite purple when I got out of the shower. My hair still had some crunchiness too it, but was considerably softer and I could at least somewhat brush through it. Somewhat. Day two with it in my hair it seemed like more people noticed it, but my hair was pretty unmanageable after sleeping on it, still crunchy and pretty much 100% tangles. Honestly, it looked like dreads! Also, I was still leaving behind a fine dust of purple all over myself. And even the little one I nanny had a little dusting of the stuff on her face at one point. Oopse! And my scalp was extra itchy. I liked how it looked, and how it showed up in certain light, but at this point, I was pretty over the stuff. I washed it again, hoping this would be the end of it. I deeply shampooed it twice and the itchyness was pretty much gone and my hair was mostly back to itself. There was still some color to it, but mostly just at the ends. All in all, it was pretty fun, but not really worth the mess and the itchiness. Maybe I did something wrong. Maybe I was a bit allergic to the stuff. Maybe there was a way to do it so I didn't leave purple fairy dust everywhere I went. I suppose it's not really meant for all of your hair, and more just for tips. If was I was to do this again I would probably just take the time to do it just on the highlights of my hair. And probably just let it air dry and brush it out while standing in the shower. If you have any advice or any other ways to try out a fun color on dark hair, without the mess, let me know!